Northern Ireland’s Under-19 women continued their preparations for next month’s UEFA Women’s finals with a second win over Wales and lift SuperCupNI silverware. Alfie Wylie’s side were impressive in their 3-1 win in the first game against their Welsh counterparts at Ballymena on Saturday, but on Monday they were outstanding in a 4-0 success. Two goals from Rebecca Bassett and one apiece from Emma McMaster and Louise McDaniel ensured a 7-1 aggregate score over the two games to secure the SuperCupNi Women’s U19 trophy. 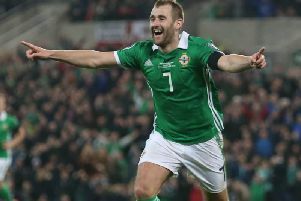 Northern Ireland host the UEFA finals from August 8 to 20 when the hosts will meet Germany, Spain and Scotland in the group stages. And women’s manager Wylie believes the double victory over Wales was perfect preparation. “I think on top of that it was just how well we were organised. Wales scored a goal late on in the first match on Saturday but other than that, they did not really trouble our goalkeeper so our organisation without the ball was immense. “These two matches give us a platform to build on and when we got the ball forward we had players who can put it in the back of the net. “So lots of really good positives, very good performances all around and a super squad effort over the two games, but we know there are stiff challenges ahead,” added Wylie.